Living with a house rabbit can be a great addition to the family home and provide a rewarding and fun experience. There are some essential practicalities to understand before deciding on bringing a rabbit indoors, from bunny proofing the home to feeding and bunny accommodation. In general rabbits shouldn’t be considered low maintenance pets and the same goes for house rabbits. They have some basic needs that have to be fulfilled so their welfare standards are met. Houserabbits, with their loving and intelligent personalities, can however provide a rewarding companionship experience for pet owners. Houserabbits tend to exhibit increased natural behaviour than outside rabbits because they tend to get more exercise and it’s easier to meet the needs of house rabbits and their welfare requirements. Is a house rabbit right for me? Houserabbits, like cats and dogs, have some basic needs like a litter tray, the correct food, exercise, love and affection. Moreover this question might be better worded “is my lifestyle right for a house rabbit?” or “will I make a good house rabbit owner?”. You need to be a patient person who can give over a few hours every day to care for your house bunny to make sure it’s needs are met and that it gets lots of love and attention. You should also be comfortable and able to get on the same level as a house rabbit, e.g. spend lots of time on the floor interacting with a house rabbit. You should also be prepared to spend time training a rabbit not to eat your furniture and understand that nibbling and chewing is a natural behaviour so don’t get too upset if you find they’ve started nibbling your furniture, especially in the early days of house rabbit training. What rabbits make good house rabbits? Any really! Young, old, male or female all make excellent house rabbits. Rabbits have some instinctive behaviours so any breed will work and they adapt very easily to the indoor life. Older bunnies might be easier to train and quicker to show their personalities than younger rabbits so consider re-homing a rabbit from the RSPCA or other animal welfare charity. Rabbits are sociable creatures so keeping house rabbits in pairs is a good idea, though if you are thinking of going it alone and keeping just one house rabbit be prepared to invest a lot more time interacting with it. In reality, what turns a rabbit into an excellent house rabbit is the training and care provided by you! 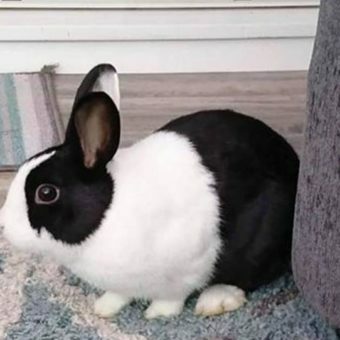 Before you even contemplate introducing a new rabbit into your home or bringing your outside bunny indoors you’ll need to prepare and get everything setup for your house rabbit. Make sure you have covered the basics; a decent sized cage, hayrack and a food dish with food in it, a water bottle attached to the cage, some rabbit toys and most importantly the litter tray filled appropriately. If you are bringing your outside rabbit indoors, then fill the litter tray with the contents of his outside loo to get him adjusted to using the litter tray quicker. If it’s a new rabbit, then line the cage with newspaper and put the litter tray in one corner with plenty of hay. Keep an eye on his toilet behaviour and move any droppings or newspaper that has been weed on into the tray to reinforce that this is the place to go to the toilet. You need to be very patient when bringing your new bunny into your home – put him in his cage and leave him alone. Avoid the temptation to pick him up and cuddle. As with introducing cats to a new home the first moments in a new environment, although exciting for you, can be a really nervous time for the rabbit and you don’t want him to become over-stressed. Give your house rabbit space to acclimatise to all the new noises, smells, temperature, the TV, the daily household routine and perhaps even your other pets. You want your new bunny friend to relax and understand that his cage is his territory and know where his toilet is. Do this even if you are bringing your outside rabbit indoors. Still in the cage, you want to start getting your new furry friend used to you and your noises!. Sit near the cage and talk to your bunny. You’ll know when he is ready when he comes to you and the easiest way to move this process along is to give him some rabbit treats. You want to give small amounts of treats that are quick to eat rather than a large treat – he might run off with it to eat it elsewhere in the cage when you want him to be close to you instead. This also allows you an opportunity to teach your bunny his name by associating the noise with food when his name is called. As rabbits are prey animals they don’t have excellent front vision so when giving your bunny some treats feed them from the palm of your hand rather than in-between your fingers to avoid any nasty nibbles! Whilst your end goal might be to allow your house rabbit free reign of the house, you’ll want to introduce your rabbit slowly. Pick a time when the house is quiet, block off any areas in the room you don’t want your bunny to go initially and please make sure you have rabbit-proofed your room! The last thing you want is him hopping off behind the TV cabinet to nibble on cables. When you feel your bun is relaxed enough open the cage door. Set aside 1/2 hour or so and the best time to do this is before his usual feeding time as he’ll be less likely to poop and it will be easier to get your bunny back in the cage when it comes to food time. Don’t be tempted to pick him up out of the cage, let your bunny come out in his own time and on his own terms. You want him to understand that his cage is still his territory and his ‘safe place’ to go to. Your bunny might not even come out at all – which is perfectly fine. Don’t force the issue and make sure you are relaxed as well by lying on the floor (with some tasty bunny treats, of course!). Your rabbit will eventually come out to start discovering this new space. Depending on your bunnies personality he might be a bit tentative and want to take things slowly and at his own pace in which case let him. On the other hand, he may hop out of his cage and start bounding around the room. Keep talking to your rabbit and offering treats whilst calling his name. Don’t be tempted to pick him up at this early stage, your goal here is to get your bunny house trained and comfortable in these new surroundings. Having treats in a tin that rattle can be a good way of distracting your rabbit away from an area and focusing his attention. After about 15 minutes you should start the process of enticing your rabbit back into his cage and as it’s feeding time fill his food bowl to get his attention. This is all personality dependent – some, usually older rabbits may know to go back in their cage whilst younger bunnies will probably dither around. Your best tactic is treats and rewards. Again don’t pick your rabbit up to put him back, let your rabbit do it his self and associate a word with what’s going on like ‘bedtime’. If you have a stubborn bunny who doesn’t want to go home, you might need to create a passage that leads to his cage and entice him back with treats. Gently pester your rabbit to make him want to get away from the (gentle) harassment. Repeat the process above more than once a day for a week or so until you feel your bunny is relaxed and comfortable. Older rabbits can usually stay out for longer than younger bunnies who may get distracted more easily and maybe forget where their toilet is located. Judge it yourself by paying attention to your rabbits behaviour when he is out of the cage. If you know that you are time limited and can only allow your bunny out for a specific length of time then try and stick to this routine otherwise if you need to dash your bunny may not want to go back in his cage feeling his missing out on his out-of-cage time.